Thousands of bikes are stolen across Canada each year. In Vancouver, as cycling becomes a more common mode of transportation, the police advise that the rate of thefts is also going up! It is estimated that a thief can steal your bike in less time than it would take you to order a cup of coffee. In 2015, Vancouver had 513 thefts per capita. Compare that to Toronto where the theft ratio was only 119 thefts per capita. Most other major cities in Canada range somewhere in between, but in general, Vancouver sees double the amount of thefts compared to any other major city. Bike theft also goes unreported a lot of the time, with police estimating they only hear about just over 50% of thefts. So having said all this, if you live in an area where bike theft is common, what can we do to protect our bikes? Most experts agree on some theft prevention measures. While this list is not exhaustive, following these tips will definitely increase the security of your bicycles. Lock your bike, always, even if you’re just leaving it for a moment. Buy a U-lock or D-Lock with a flat or disc key. U-locks are strong and the better ones even come with theft warranties. Never use a cable lock alone as it is very easy to cut through. If you do lock your bike outside, choose a public space and never leave it outside overnight. Lock through the frame and a wheel. Add a cable, cable lock, or second U-lock to lock the second wheel. If you use two different locks, such as one for each wheel, a thief would need two different types of tools. Make sure the pole you’re locking your bike to is bolted down and can’t easily be removed. Make sure your bicycle cannot be lifted over the object. Don’t lock your bike to objects that can be cut, such as wire fencing, trees, or wooden railings. Lock your bike even when keeping it in a garage, storage facility or shed, or even on a porch. Remove any detachable items like lights, bags and quick release parts and take them with you. Store your bike inside if space is available. 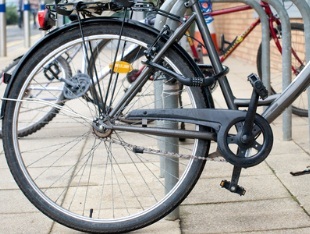 If you have your bike locked outdoors and return to find it damaged, try and bring it home with you right then, it is possible someone damaged it intentionally hoping you would need to leave it unattended longer, giving them more opportunity to steal it. Record your bike’s serial number, and keep the receipt. Etch your name into the frame of the bike; it can help identify it in the event of a theft. Take a photo of you and your bike. Watch for your bike online. Many stolen bikes are resold on Craigslist or other online resale sites. If you see your bike online, contact your local police department to assist you with recovering it. Broadcast that your bike was stolen on social media. Friends or family can help recover it. Make a police report if your bike is stolen, and supply them with the description and serial number. Often, even if a bike is recovered, police have no way of knowing who the owner is. If your local police department has this service available, considering registering your bike. If it is stolen, and they recover it, it makes it much more likely that they will be able to know who to return it to. Finally, make sure your bicycle is properly insured by your home insurance provider. Don’t assume it’s covered. Check with your agent! Some policies exclude bikes unless you specifically add them. Other policies have limits on the amount they’ll pay for any one bike, which can be increased if necessary, or they may require some sort of receipt or valuation on file showing the replacement cost of the bike prior to the loss. Discuss how much it would cost to replace your bicycle with your insurance provider and make sure you also consider any upgrades or add-ons, or customizations you have done. Any valuations or receipts they require would need to be on file with them prior to the loss. You will want to confirm your bicycle coverage is for the full replacement value of your equipment and discuss any deductibles that may also apply.